John Chumack sent SPACE.com this photo of comet ISON’s nucleus taken on the morning of Oct. 9 from his dark-sky site at John Bryan State Park in Yellow Springs, Ohio. “I’m excited to see what comet ISON will do in the next 60 days,” he wrote SPACE.com in an email. He used a QHY8 cooled single shot color CCD camera and his homemade 16" Diameter F4.5 Newt. Telescope to take the image. The promising Comet ISON is steadily making its way closer to the sun and one avid amateur astronomer has snapped a series of spectacular photos of icy wanderer in action. Veteran astrophotographer John Chumack took the new Comet ISON photos and shared the series with SPACE.com. The images, taken in color as well as black and white, show striking views of the approaching comet. John Chumack sent SPACE.com this photo negative of comet ISON taken on the morning of Oct. 9 from his dark-sky site at John Bryan State Park in Yellow Springs, Ohio. “I will be imaging the comet every clear night I get through Perihelion Passage, on Nov. 28, and throughout December and January,” he wrote SPACE.com in an email. He used a QHY8 cooled single shot color CCD camera and his homemade 16" Diameter F4.5 Newt. Telescope to take the photo. On Nov. 28 — the Thanksgiving holiday in the United States — Comet ISON will approach within 730,000 miles (1.2 million kilometers) of the sun, a close shave above the solar surface. If the comet survives the solar encounter, it could flare up brilliantly in the night sky, astronomers have said. Chumack captured the new Comet ISON images on the morning of Oct. 9 from his dark-sky site at John Bryan State Park in Yellow Springs, Ohio, using a QHY8 cooled single shot color CCD camera and his homemade 16" Diameter F4.5 Newton telescope. "I'm excited to see what comet ISON will do in the next 60 days," he said. 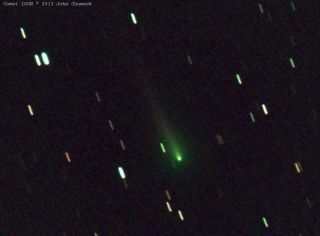 John Chumack sent SPACE.com this photo of comet ISON taken on the morning of Oct. 9 from his dark-sky site at John Bryan State Park in Yellow Springs, Ohio. “I’m excited to see what comet ISON will do in the next 60 days,” he wrote SPACE.com in an email. He used a QHY8 cooled single shot color CCD camera and his homemade 16" Diameter F4.5 Newt. Telescope to take the image. While making what is apparently its maiden voyage to the inner solar system from the distant Oort Cloud, Comet ISON was discovered by two Russian amateur astronomers in September 2012. Skywatchers are likely in for a wonderful show in early December if the comet survives its potential brush with the sun next month.